Blues gaffer Darren Williams cuts an animated figure during Saturday's win over Stourbridge. Picture: Brian Murfield. Good, but could do better. That is the verdict from Whitby Town boss Darren Williams following his side’s opening day victory over Stourbridge. The Blues gaffer took plenty of positives from Saturday’s 4-0 success at the Turnbull Ground, but said he does not feel that Town were quite at their best. 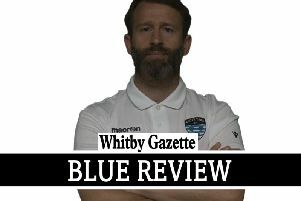 “Obviously I’m very pleased with four goals and a clean sheet and while I don’t want to rain on the lads’ parade, I told them in the dressing room after the game that I thought they were actually a bit below par,” Williams told the Whitby Gazette. “We didn’t play as well as we can and we started both halves quite slowly. Mikey Roberts, Matty Waters and substitute James Brown were all on target against the Glassboys, and the fact that three of his strikers managed to find the net was one of the more pleasing aspects of the win for Williams. “It’s great that all three of our centre forwards have got goals, we created some good chances and took them well,” he added. “At the moment we are taking our chances, which is very important, and we need to continue to do so. Williams believes that the strength of the squad currently at his disposal was a key factor in Saturday’s win. “The bench we had against Stourbridge was the strongest it’s ever been since I took over here,” he added. “The competition for places we have at the moment is a massive positive. It means all the lads know that they have to be on top of their game or they might lose their spot.